If you are looking for information on the Plato's Closet franchise business opportunity, Platos Closet franchises or Plato's Closet franchising, then you have come to the right place. Plato's Closet® is all about being fashion savvy and shopping smart. We're a unique recycling retail store just for teens and young adults (girls' size 12 to juniors' size 15; guys' size 12 to waist size 38) - we buy and sell the latest looks in gently used clothing and accessories from the hottest names. We're not your typical resale store! Our process is quick and easy; we buy every day, and will pay cash on the spot for the items we can sell. Thank you for your interest in becoming a member of the Plato's Closet franchise family. Plato's Closet offers a truly unique retail franchise opportunity, as it is the only national teen retail store of its kind -- focusing on the buying and selling of gently used, brand-name apparel and accessories for girls and guys! We already have over 200 store locations throughout North America, and that number continues to grow. Our stores fill a distinct niche in the retail marketplace. We are the only national resale business that specializes in the teen and twenty something market group. The wish list for trendy, brand-name apparel and the availability of it in virtually every teen's closet presents fantastic opportunities for both franchise owners and customers alike. Making the decision to be your own boss and be in control of your future is an exciting adventure, and we appreciate being considered in your business search. 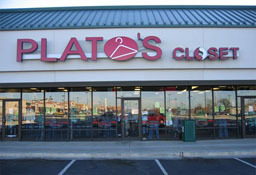 A Plato's Closet franchise offers franchisees a very unique opportunity, based on a sound business model and the support of the parent company, Winmark Corporation.